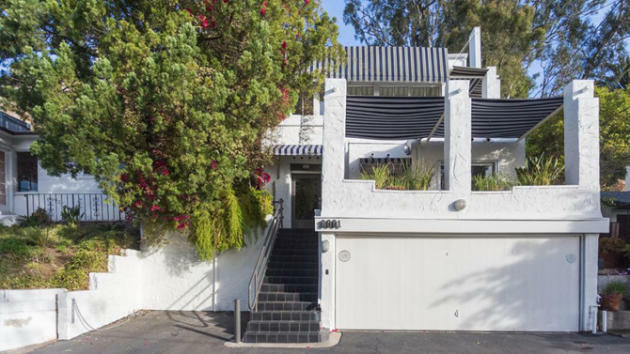 YOUR MAMA’S NOTES: Famously neurotic veteran stand up comedian and actor Richard Lewis, also famous for always wearing all-black clothing on stage, has his Tinseltown pedigreed home at the tail end of a little-known cul-de-sac just above Hollywood Boulevard near the southern mouth Laurel Canyon in Los Angeles up for sale with and asking price of $1,559,000. Property records show Mister Lewis acquired the 2,508-square-foot two-bedroom and two-bathroom house in August 1989 for $720,000 and listing details, which make no secret of the seller’s identity, show the three-story house, a Bauhaus meets Mediterranean sort of thing set atop a street level two-car garage, was once home to late actor Eddie Albert. An exterior flight of slate-paved stairs leads from the street to the discrete entry that opens to a living room with tiny square taupe tile flooring, wood beamed ceiling, and a minimalist fireplace with an Art Deco style screen. Glass doors lead to a slate-tiled terrace with black and white striped awning and through-a-thicket-of-telephone-wires view over Hollywood. The floors switch to honey-toned hardwoods in the dining room and eat-in kitchen that’s updated with sleek snow-white cabinetry, cement colored solid surface counter tops, and an up-to-date assemblage of name-brand stainless steel appliances. Up on the second level, a wall-to-wall carpeted media lounge/family room has two long walls of windows and glass doors — a third wall is sheathed disco-style in floor-to-ceiling mirrored panels — that open to a slender black and tiled terrace with another black and white striped awning as well as a free-standing fireplace that looks decorative rather than functional. The master suite privately occupies the entire uppermost “penthouse level” and incorporates a private office/den with terrace access, a bedroom with a windowed inglenook lined with cushioned bench, and a white ceramic tiled bathroom with windows that provide an open, over-the-rooftops view of the cluster of towers that comprise downtown Los Angeles. Property records suggest Mister Lewis, whose television credits include recurring roles on “7th Heaven,” “Curb Your Enthusiasm” and, most recently, the cable sitcom “Blunt Talk,” and his wife Joyce Lapinsky, a non-profit executive, have already purchased their next home, a 2,290-square-foot 1960s ranch with three bedrooms and 2.5 bathrooms that was redone with what listing details called a “’Zen’ sense of calm above the bustling city” and sold earlier this year for $1,537,500.